Oman Air, the national carrier of the Sultanate of Oman, is delighted to announce that a new Boeing B737-800 aircraft has joined its fleet as of 24 January 2017. 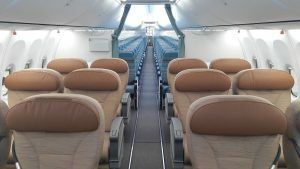 This new aircraft will be used on short and medium haul routes and has a capacity of 162 seats, with 12 Business class seats of seat pitch 46 inches and 150 Economy class seats with seat pitch 30 inches. Each seat is equipped with an LCD screen, back-mounted 10.6 inches. Oman Air has operated B737s for many years and the aircraft provide the backbone of the airline’s long and medium haul fleet, with 23 currently in operation. The new aircraft will be deployed soon on its arrival for commercial flights. 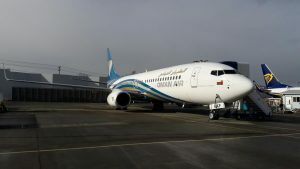 With the addition of the new Boeing 737 – 800, Oman Air’s fleet stands at 48. Currently Oman Air’s fleet consists of four Boeing 787 Dreamliners, six Airbus 330-300s, four Airbus 330-200s, five Boeing 737-900s, 23 Boeing 737-800, one Boeing 737-700 and four Embraer 175s. A second new B737-800 will be joining Oman Air’s fleet on 16 February, followed by a Dreamliner B787-9 on 23 February 2017. The delivery of new aircraft is part of Oman Air’s ambitious and dynamic programme of fleet and network expansion. The airline continues to be recognised for its award winning on board experience; winning an array of industry awards in 2016 to add to its growing collection.